On the 11th (Wed), wander the streets of Old Port, take in the spiritual surroundings of Basilique Notre-Dame de la Garde, and then take in the dramatic natural features at Calanques. For reviews, ratings, more things to do, and more tourist information, refer to the Marseille online route planner . Toronto, Canada to Marseille is an approximately 12.5-hour flight. You can also do a combination of flight and train. The time zone difference when traveling from Toronto to Marseille is 6 hours. In July in Marseille, expect temperatures between 35°C during the day and 22°C at night. Finish your sightseeing early on the 12th (Thu) so you can drive to Saint-Tropez. Saint-Tropez is a town, 100km west of Nice, in the Var department of the Provence-Alpes-Côte d'Azur region of southeastern France. Start off your visit on the 12th (Thu): enjoy the sand and surf at Plage des Canebiers and then tour the pleasant surroundings at Plage de Pampelonne. 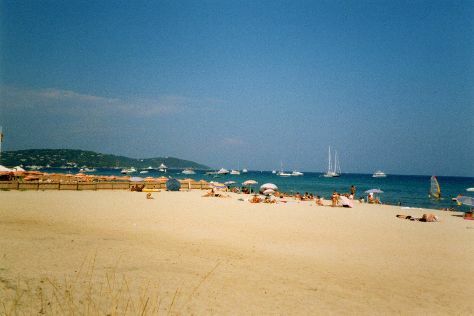 To find ratings, more things to do, maps, and other tourist information, use the Saint-Tropez trip maker site . Drive from Marseille to Saint-Tropez in 2 hours. Alternatively, you can take a train; or do a combination of train and bus. Expect a daytime high around 38°C in July, and nighttime lows around 20°C. Finish your sightseeing early on the 12th (Thu) to allow enough time to drive to Cannes. Change things up with a short trip to Cap-Sea in Agay (about 44 minutes away). Spend the 13th (Fri) in some colorful company at Marineland. Next up on the itinerary: contemplate the long history of Lérins Islands, test your team's savvy at popular escape rooms, and glide peacefully along the water with some of the best stand-up paddleboarding in the area. For reviews, more things to do, and other tourist information, read our Cannes road trip site . You can drive from Saint-Tropez to Cannes in 1.5 hours. Another option is to do a combination of bus and train. While traveling from Saint-Tropez, expect a bit cooler days and about the same nights in Cannes, ranging from highs of 33°C to lows of 21°C. Finish your sightseeing early on the 16th (Mon) so you can take a bus to Nice. Kick off your visit on the 16th (Mon): get great views at Colline du Chateau overlook, then wander the streets of Vieille Ville, and then enjoy the sand and surf at Plage de Passable. On your second day here, don't miss a visit to Promenade des Anglais, don't miss a visit to Place Massena, and then enjoy the sand and surf at Castel Plage. For photos, reviews, where to stay, and other tourist information, read Nice online road trip planner . Nice is just a short distance from Cannes. Traveling from Cannes in July, you can expect nighttime temperatures to be somewhat warmer in Nice, with lows of 25°C. Finish your sightseeing early on the 17th (Tue) to allow enough time to travel back home.